I recently finished making a 70th birthday book and along the way I came across this wonderful family photo of 1916 leader Joseph Plunkett and three of his six siblings as small children. The person who commissioned the book, musician and author Honor O’Brolchain, is Plunkett’s grand-niece and has many lovely old photographs of the family. Lafayette studios, the historic Dublin company, took the photograph in 1896, at the time of the Lord Mayor’s Fancy Dress Party for children. Joseph (Joe – extreme right) is dressed as a gallowglass, a mediaeval Irish warrior. 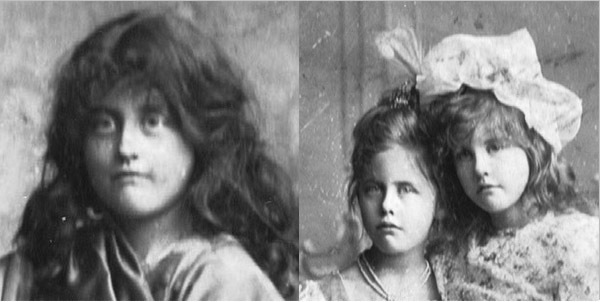 The other children are (left to right) Geraldine as the ‘Duchess of Savoy’, Moya as a Kate Greenaway character and Mimi in ‘an Irish costume’. According to Honor, her grandmother Geraldine didn’t much enjoy being dressed up for the Ball in her uncomfortable costume. As if that wasn’t bad enough, the children had to dress up again in the following days to have this portrait taken. It was probably not much fun, as photographers at the time used neck clamps to keep children still while the photo was taken. Perhaps Joe refused a clamp – you can see by the slight blur of his face that he couldn’t help moving a little, unlike his sisters who at least had each other for support! Maybe Joe didn’t mind the outing to the Lord Mayor’s Ball too much, as he kept a taste for dressing up into adulthood . Honor has other rare family photographs of Joe dressed in a long dramatic cloak, and costumed as an Arab prince. Some of his fellow revolutionaries, such as Countess Markiewicz, also liked to costume themselves during the Celtic Revival cultural movement. 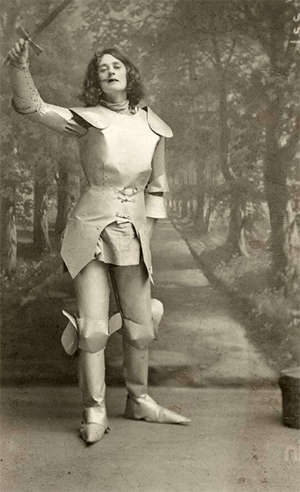 In this photo, the Countess taking part in a historical tableau as Joan of Arc. Here is the building that housed the Lafayette studios, which still stands facing O’Connell Bridge. 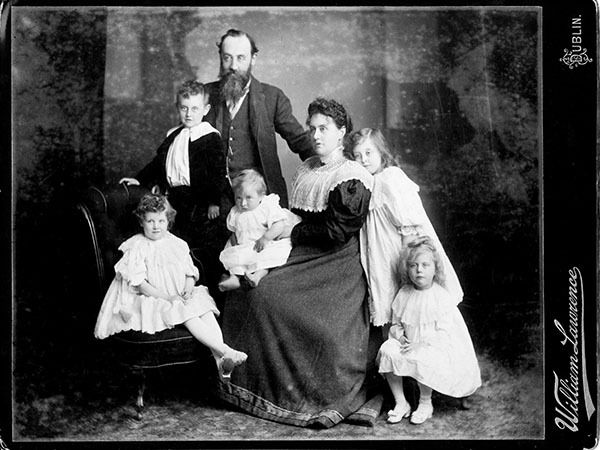 A couple of years before the Fancy Dress Party, the same four Plunkett children along with their baby brother George, sat for a family portrait in the Lawrence studio on Sackville Street (now O’Connell Street) with their parents, Count George Noble Plunkett and Josephine Plunkett. The family, who were quite wealthy, invested regularly in formal portraits, which was a fashionable thing to do at the turn of the century. Sadly, the negative for this portrait may well be lost forever, as in 1916 the studio, which was opposite the GPO, was looted and burnt down during the Easter Rising and most of its portrait negatives were destroyed. 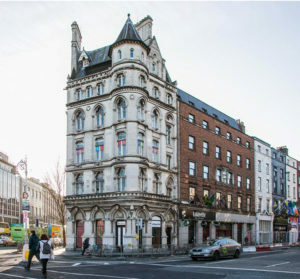 Left to right above are Moya, Joseph, Count Plunkett, George, the Countess, Mimi and Geraldine. 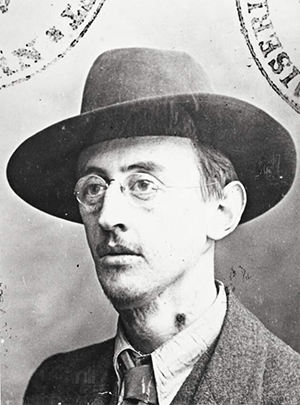 Lastly, here is a more familiar image of Joseph Plunkett, taken nearly 20 years after his visit to the Ball.